The building occupies a central position, on a raised mound, in the village. It is believed that a Saxon church stood here but no evidence has been found. 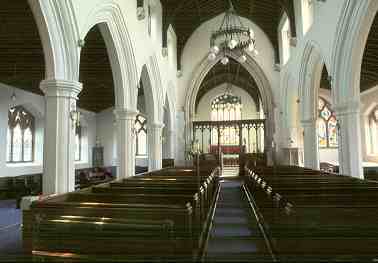 In the 12th century Wymeswold church had connections with Beauchief Abbey, Sheffield. In the 13th century a more notable church was built and traces of this remain; but by the 14th century the stone was badly decayed. 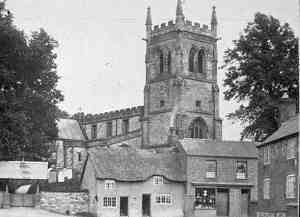 It was in the 14th century that the present church was built and much of the present fabric, including the tower and knave, dates from then. A fine spire was struck by lightning in 1783, damaging it so badly that the remains had to be removed the safety's sake. 1220 is the first day to the institution of a vicar. At this time Beauchief Abbey held the advowson (right to appoint vicars). The advowson later passed to Trinity College, Cambridge. Many priests were non-resident, holding office elsewhere or at the College. Far Street with St Mary's church and old cottage by Stockwell Stores, taken between about 1908 and 1918. The Wymeswold school log books have an entry for 1908 stating that the children were taken to see the pinnacles shortly before they were installed on the top of the tower. The timbers from the cottage to the left of what is now Stockwell Stores were used to keep a bonfire alight at the end of the Stockwell all day and all night on Armistice Day, November 11th 1918. In 1835 the Rev Henry Alford was offered the living of St Mary's. When he took up residence he was the first incumbent to live in the village since 1776. Not unnaturally he found decay everywhere. He enlisted the help of friends from College days, especially that of the architect, August Welby Pugin, to 'restore' the church. It was a very thorough job, done in the Gothic manner. Pugin restyled the north porch, the room over it, and designed the furniture, the pews, the roof of the nave, a new font, light fittings, windows and sedilia in the south-east window recess of the chancel. Very little escaped his attention. The medieval rood screen, which earlier been moved because of decay, was replaced by one of his own design in the altered chancel arch. A small section of the old screen can be seen on the baptistry wall. The lych gate was also built (in the Gothic style) and a new school. Henry Alford built a new vicarage (now Alford House) on the outskirts of the village. He was brilliant scholar and musician, now best remembered for his hymns, chiefly 'Come, ye thankful people, come', for harvest time. He moved to London 1853, as minister to Quebec Chapel and in 1857 was made Dean of Canterbury. He was there until his death in 1871. The stained-glass windows are from Pugin's time and window commemorates Dean Alford's son who died as a child. 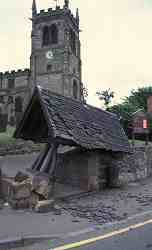 The lych gate after an army container lorry reversed into it, July 1996. It has since been fully restored. The church plate. St Mary's has a silver flagon and paten of 1705, a gift (according to Potter) presented by Dame Katherine Yorke, relict of  1. William Leake, esq., Seargeant at Law, 2. Sir William Yorke of Lessingham, Linc. Knt'. St Mary's also has 'a silver cup used as a chalice' hallmarked for London 151213. The colours of the 504 (County Nottingham) Squadron are laid up in St Mary's Church. This shows their badge and motto, 'Vindicat in Ventis', and commemorates their participation in the Battle of Britain 1940, France and the Low Countries 1940, Home Defence 194042, Atlantic 19412, Arnhem, Fortress Europe 194244, Normandy 1944 and France and Germany 194045. All details are beautifully embroidered, including the borders of the red rose with white centre, the leek, thistle, shamrock and interwoven oak leaves on a pale blue background. An eagle surmounts a pole. There are also British Legion flags and the Roll of Honour commemorating the dead of the 191418 and 193945 wars. The church bells. There are six bells in the tower, All cast by Thomas Osborn of Downham Market in 1795 and tuned and rehung by John Taylor & Co. of Loughborough in 1937. In 1783 there were only four bells and these were much damaged when the spire was struck by lightning. According to an agreement dated 4th August 1742 (now in Leicestershire Record Office) between Thomas Hedderley of Nottingham, bellfounder, and the churchwardens, Hedderley undertook to recast the third bell and 'uphold the same sound and tunable' for a year and a day for the cost of 20 shillings per hundredweight. The ring was increased to six bells in 1795. According to The Church Bells of Leicestershire of 1876 the daily bell was rung at 5 a.m. during the summer months and at 6 a.m. in the winter, also at 6 p.m.. Tradition says that the parish clerk formerly received the proceeds of a close of land for performing this duty. He now receives, according to this book, �1/10/ per annum in lieu. Who, content with having deserved higher honours, not only refrained from seeking them, but firmly put them aside when freely offered to him; being already by ancient lineage, by tried loyalty, by untarnished honour, by unrivalled knowledge of jurisprudence and devotion to study, Sufficiently Illustrious. None knew better than he how to unlock the recesses of all English law; and he had a skill quite his own in drawing forth from the statutes of realm, from the roll of judicial decisions, and from long-established usage, their very innermost meanings. Wherein he made it is chief aim to draw together rival suitors to a peaceable agreement, and to earn the gratitude of all men. So, endearing himself to Prince and people, he carved for himself a way to a higher degree of dignity, yet all unwillingly on his part; since, having been raised by King Charles the Second to the exalted Bench of Ermined Judges (1679) he immediately resigned that splendid office, setting the rare example of the most singular moderation, as one who so little depending on Fortune, having never at any time hoped her favours, so he had no need of dread the want of them. Died the 9th day of October 1687, in the 57th year of his age. His wife Catherine, and his only daughter Catherine, as sorrowing mourners, have placed this marble to his memory.